I wish the L. Hamilton contributions on the Long-term Graphs page would get updated. I'll update that page before the melting season starts, Tor. "before the melting season starts"
The Long-term Graphs page has updated L. Hamilton graphs already. Were you afraid the melting season would start this month? Gratitude to L.H. for providing the graphs. With the 'Minimum Daily ASI Extent' bar graph starting at zero, the amazingness of the 2012 season is exposed. About 4 weeks and 9% of extent gain to go. Extent today down by 1k km2.Each update points a bit more firmly to a record low maximum. Even if there is a largish extent gain from now, that ice will be very thin. Is there any possibility of a flatline for a month? What is the date, on average, that maximum extent is reached? Is the extent maximum or melt onset occurring earlier in the year? No definite trend on this what I remember, the reason why I asked about the flatline month is that I've got no idea what North Pacific and North Atlantic are doing just now. The Arctic melt season is lengthening. Is that because freeze onset is occurring later in the Fall? Onset would have a trend but varies with currents, I believe... General thinning of arctic ice is one prediction that's long been included. So in Hudson's bay you would see a shorter melt season if you measured time elapsed from date of maximum (100% ice) to date of minimum(zero-ice), and a longer melt season if you measured time from date of maximum sea ice to date of ice starting to reform. The confusion is looking at the Arctic as a whole versus places on the periphery. It is quite confusing. The fact remains that at 26 Jan 2018 there is 2.1 million km2 less Arctic sea ice than the 1980's average. March or September, perhaps, but not this month, not January. Month-to-date, NSIDC extent has grown by just under 900k. That's on the lower end of things, but it's nowhere near a record. In fact, both 2012 and 2015 saw smaller month-to-date increases. It would make sense that the length of the cold (warm) season hasn't changed. What might be a more interesting question is the temperature at the onset of the cold (warm) season. I would expect the temperature at onset of the cold season to remain fairly low until there is not enough ice to keep the ocean cold during the warm season, and then a fairly rapid decline in the freezing season. I think it will be important to contrast this with last season. We were extraordinarily warm to start, and cooled off significantly (relatively speaking...) from around this point onwards. This season we started off cooler, but may be finishing warmer than last year. I suspect we'd be better off if it were the other way around. I'd agree. Cold summers and warm winters are not happy happy joy joy for Humans. I think the best measure is something that shows the lengthening of the ice-free period. Using Wipneus' AMSR2 regional extent chart, I made this crude animation showing my thinking. Define "Less than full ice cover" as <95% coverage, and "Nearly ice-free" as <10% coverage. Of course, these are arbitrary thresholds. Comparing 2017 to 2012 for the Chukchi, the "less than full" period was longer by ~2 months, while the "nearly ice-free" period was longer by ~1.5 months. "Melt onset" could be defined as the first date where it goes below 95% and doesn't rebound. "Refreeze onset" could be defined as the first date where it goes above 10% and doesn't rebound. I like where you're going, oren. For the open-ended basins (Greenland Sea, Bering Sea, etc.) the 'full ice cover' area will be an arbitrary number (average max of 1979-2008 [30 yrs] prehaps?) (and will determine the 'refreeze onset' boundary. Another Chukchi animation along the same logic, but going back to 1979 using NSIDC data. It can be seen that until 1990 the situation was mostly random variation on a stable theme. Since then, minima kept getting lower, melt onset kept coming earlier, and refreeze completion kept coming later. Notes: January of the following year is appended to each year. The actual date range is April 15th to January 20th. Durn Jim. That looks a little disturbing. Until you take your advice and click for the up to date version (downsized copy attached). The decadal averages seem to be accelerating downwards too. When I take note that the previous spread over 20 years on this date is about twice the gap with the previous 2006/2017 record presently, I feel a little prone to question the "not quite" part of your statement. Reckon won't be long until feb 1 is time for Nevs to open the melt season thread. With 14C ssts off Svalbard, and +9C SSTAs off NFL and KMCH, the assaults on. A climate system in a chaotic state will behave chaotically. Perhaps our search for a new normal is misguided as abnormal variance now is the new normal. On average about 45 days, just 0.83 million km2 and 8% of extent gain to go. Extent max date in the past has ranged from 32 days to to 61 days from Jan 29. Note that this does not correspond to min and max extent gain from now. So who knows the final result, though a record low is still on the cards. In the last three days daily extent gain has increased to above the average for this time of year. 2018 set record lows in the NIPR Extent record almost every day in January, nearly wiping 2006 off the chart in the process. It's a little sobering to consider that the lows we're witnessing today with a mixture of odd excitement and plain terror will all be beaten within 10 to 12 years. It's a little sobering to consider that the lows we're witnessing today with a mixture of odd excitement and plain terror will all be beaten within 10 to 12 years. Looking at the FDD I'm wondering if you didn't mean 1-2 years. The less cold you have left the harder it is to keep things cold, and I don't know when there is no longer enough ice, but when there is no longer enough ice the last of it leaves pretty close to instantly. B. It's a little heartening to think these records may hold for 10 to 12 years... and not 1 to 3 years as my unsupported gut feeling suggests. Extent gain continuing to accelerate, up another 96 k. Average extent gain in the these last 6 weeks remaining of 0.72 million would produce a maximum of just under 14 million km2, whoops less greater than than last year's record low of 13.88 million km2..
Perhaps the extraordinary cyclone due to start roaring up into the Greenland Sea to over the North Pole will change things for a few days? The coming cyclone may briefly *increase* extent while potentially reducing area. It will stir things up no doubt. Key question for me is whether the heat drug up from depth results in an early max. It's not just one cyclone. It's a vortex around Greenland that will bring repeated intense storms with huge waves. Watch for Jim Hunt to drop into Nazarre with his longboard. Seriously, the wave trains in the north Atlantic and the sub Arctic seas are going to be massive. Expect massive destruction of sea ice on the Atlantic side of the Arctic and sub-Arctic. I see that looking at nullschool. Persistent 6-10M waves with 10-15 second periodicity, over a period of 72+ hours. That will stir up the top 2-300 meters of the water column quite thoroughly. You are right. I think the Barentsz in particular is going to get clobbered, especially as there is already a lot of imported "warm" Atlantic water there at depth. Expect waves heights of about 20 feet (or 6m) at the edge of the ice pack. Wave heights of 50 feet (15m) or more will be generated in the Irminger sea. Nazare surf wave face heights could approach 100 feet in this series of storms. The Coastlines of Ireland, the U.K. and France will be battered by extreme waves. Swell wave periods of 20 seconds will be generated. The long persistent fetch of very high winds will produce extraordinary surf. Surges associated with wave sets will affect areas that are normally not affected by waves. The sea ice will be slammed and driven back, but Europe will get the news coverage. No chance of that FooW! Did you see what happened to Cotty? Those maps shows 10 meter high, 15 second period waves heading straight for the ice edge north of Svalbard. Ouch. He faded right into taking that bomb on his head. He badly misread that wave and lost a lot of speed the way he faded back. He had nowhere to go once it started breaking. I hope the orhopods were able to put him back together. The model run you showed might be more accurate on the details of the wave heights than what I showed. That Navy model map shows the big picture well. It's going to be a huge swell that rocks western Europe and the ice edge. It would be interesting to review the predictions from a week ago to see if the big increase in extent during the last week was indicated. Most of this increase occurred between Baffin and Barents. If the current predictions are correct I would expect to see the extent increases of the last week largely reversed. A possible max on Jan 31 or thereabouts? Ouch. He faded right into taking that bomb on his head. I think he was hoping to get barrelled. That's not quite how things worked out! However perhaps we should keep the "wave" discussion going in the freezing season thread rather than here? I hope the orthopods were able to put him back together. i know it's just typo's (one i corrected for better understanding) but i find it funny since orthopods are probably indeed the future (robot surgeons) so perhaps you got it right by accidents because they're already in use for some hyper sensitive bodyparts like brain operations and the likes. there remains the possibility that you wanted to write the word that way and not orthopedist as i assumed. just had to smile. JAXA DATA - Extent as at 4 Feb is 13,303,213 km2, just 34 k less than extent in 2017 on that date. Extent gain dropped to about 25k per day for the last 2 days. Average extent gain in the these last 39 days remaining of 0.66 million km2 ( 7 % ) would produce a maximum of just under 14 million km2, less than last year's record low of 13.88 million km2. The question is what effect the current drama unfolding in the Atlantic side (and perhaps extended into mid-Feb) will have on ice extent in the last 40 days or so of the freezing season. Extent could initially increase as ice is spread out, and then stall or even drop as warmer water brought up from depth attacks the ice. If ice extent then became a record low maximum - would this be regarded as a genuine trend for accelerating loss of winter ice extent or merely the result of a one-off event (the MJO record oscillation currently underway) ? Forgot to add the image from jaxa. The real professionals over on 2017-208 are producing some marvellous stuff. For someone like me, much more of an observer than a practitioner, it is more a case of finding images that I can put in front of ordinary people's faces to get the message across. Weather-forecast.com is just the job sometimes. A picture (sometimes) is worth a thousand words. JAXA Arctic extent at 5 Feb 13,329,683 km2 is now 6 K km2 more than 2017, despite just an average daily increase of 26 K. This is liable to increase as 2017 goes through a very slow increase until the 11th Feb, but then large increases to about the 18th Feb occurred. As yet, the data does not reflect the impact of the cyclone. There is still the possibility (as discussed on the 2017-18 freezing thread) that the cyclone has brought large quantities of relatively warm water up from depth that might attack the ice broken up by the cyclone and, with prospects of continued northward movement of relatively warm air up through the Greenland sea inhibiting further ice formation. We will see - interesting times? ps The extent data might not show the effect of the cyclone, but the image below (JAXA sea ice drift 5 Feb) certainly does). Expect an up-tick in Fram Strait export? Last winter and this winter the Arctic ocean has been affected by persistent advection of heat and water vapor from both the Atlantic and Pacific oceans. This heat and precipitable water has been at low and mid levels of the atmosphere. This vortex splitting event is a "one off" but the storminess and warmth is not. We are watching the Arctic rapidly transition into a warmer and wetter climate. Last summer's cool stormy weather has made everything look a little better than it is. JAXA is back in lowest place February 6th after a 36.000 km2 daily drop. Latest value 13.293.000, 30.000 km2 less than 2017 for the same date. JAXA Arctic Extent as at 7 Feb 2018 13,250,852 km2 100k less than 2017 on that date. The last two days have seen a 36 k (6 Feb) and 43 k (7 Feb) km2 extent loss, due to extent losses due to the cyclone. The cyclone is more or less over, but how long will its effect last? NO doubt a topic for the 2017-18 Freezing Season. With 36 days (range 23 to 52), 0.59 million km2, and 7% of average extent gain to go, a new record low is still very possible. ps The last table suggests ( think) that loss of winter sea ice is gradually accelerating, as does the NSIDC January graph? A little more work required, methinks. For the second day in a row, NSIDC reports a century break, down 114K(!) How many times have there been a century break in February and how many times have there been two consecutive days with a century break? Meanwhile, Antarctica lost 58K so the global sea ice extent loss were a decent -172K. Is that lowest on record or is 2017 still in charge? 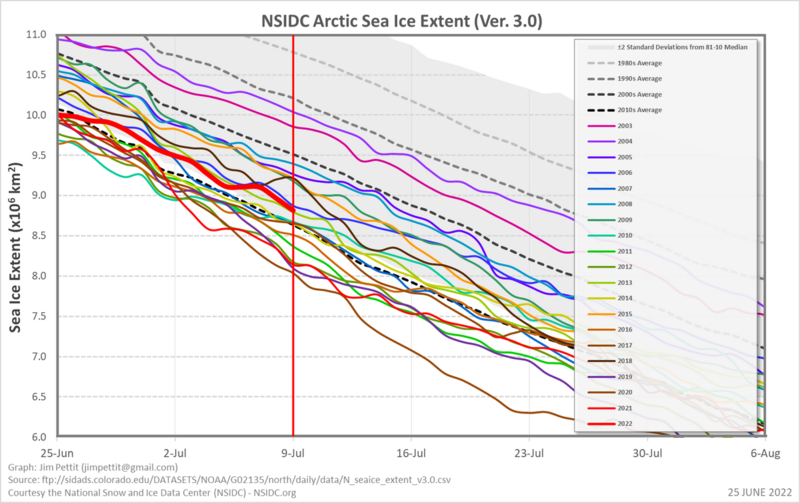 There have only been five century+ decrease in NSIDC ASI extent over the past ten Februarys, and only ten total for the month since 2000; two of those have occurred over the past two days, so it's definitely a rare thing. There have been no back-to-back century+ decreases since 2000; in fact, only 2007 saw more than one for the entire month. And we know how that year's melt season turned out. ....whoah, so we just had 2/10 of the only decreases on record this year in 2018? AND we have the lowest sea ice extent in history? ....no no no, I must not think about climate change. Look at the stock market, up ...oh ok it's down 10% in 4 days. 4th worst crash in history....b-b-but everything's going to be fine right? I must keep going to work, keep paying my bills, keep consuming useless Chinese things - this is what I'm supposed to do while the arctic melts in February and the stock market crashes. A bit like road runner out over the gorge but hasn't realized it yet.